Chip giant Intel has purchased the wireless chip division of Germany's Infineon for £900 million. Infineon is perhaps best known to consumers as the company that makes the chips used by Apple in its iPhones. The deal follows Intel's £4.9 billion purchase of McAfee earlier this month, the US security software company. 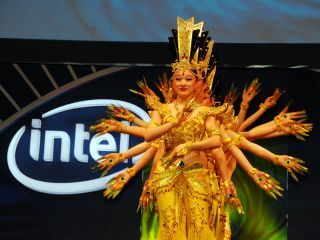 Both deals are part and parcel of Intel moving its business away from its traditional core of producing CPUs for personal computers, into newer growth markets such as security and mobile/wireless. Intel downgraded its sales outlook last week, noting that consumer demand for computers was slowing in what it sees to be a slower-than-expected recovery for the worldwide PC market. The company reduced its expected third-quarter revenues to $11bn, down from an estimated $11.6bn forecast only six weeks ago. Intel's latest purchase of Infineon's wireless unit will allow the company to boost its position in the fast-growing smartphone market. The mobile unit will remain as a standalone business, according to statements issued by both Infineon and Intel. "Infineon would make Intel an instant heavyweight (in the mobile space) and buy them three, four years in R&D," IDC analyst Flint Pulskamp told Reuters.